This little raccoon is just overwhelmingly happy. Harbor the raccoon was rescued back in 2011 after police found him on an impounded boat. For four years, he had been locked in a 2-foot-long cage, surrounded by dirt and feces. He had likely never stood up before, couldn't climb, and walked on his wrists instead of his feet because of a metabolic disease caused by malnutrition. But Harbor wouldn't let that get him down. After being taken in by California-based rescue Animal Advocates, the former "pet" got a new chance at life. He got a big cage, his own pool to splash in and lots of loving care. 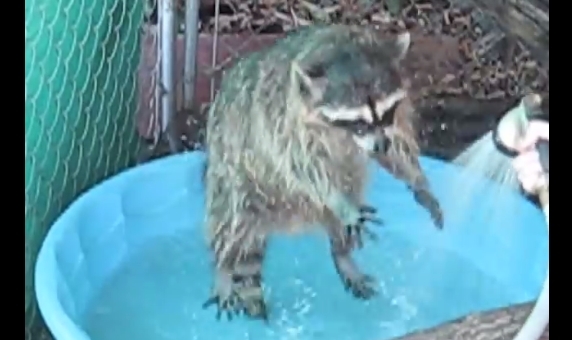 And as these videos, which were taken shortly after his rescue, show, Harbor might just be the happiest raccoon ever. This sweet raccoon might have had a tough start to life, but his little spirit seems unbreakable. Responses to "Ecstatic Rescued Raccoon Just Can't Stop Bouncing "